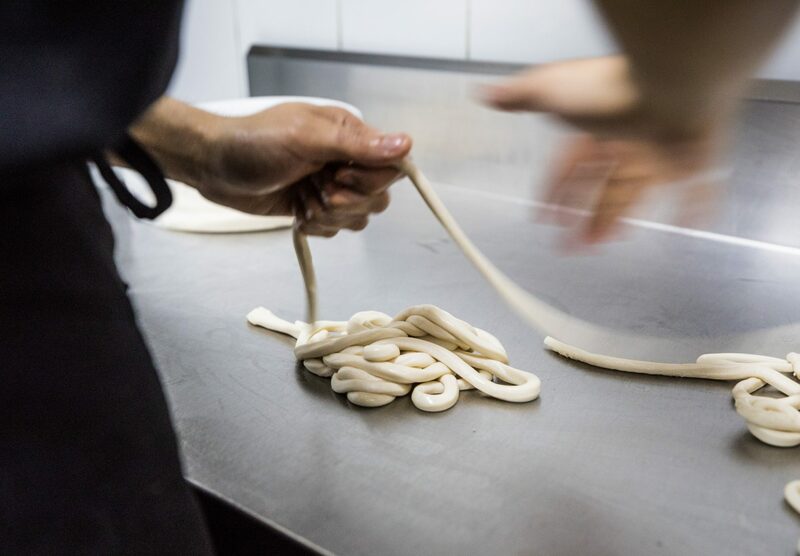 In the kitchen of Tarim Uyghur Restaurant in Sydney, Australia, Sultan Hiwilla throws hand-pulled noodles, each of them a couple of feet long, into a pot of boiling water. When the chewy noodles are cooked, he arranges them carefully in a bowl and adds lamb and bell peppers sautéed in oil, garlic and spices. Most of the dishes on the menu here involve tasty homemade noodles. There is lamb square noodle soup. Dry noodles are fried with fragrant Sichuan peppercorns, onions and chives. Broad boiled flat noodles are served in a stew of cinnamon, ginger, chili peppers and chicken that is falling off the bone. You won’t find pork and alcohol at Tarim Uyghur. That’s because everything Hiwilla serves is halal, prepared according to strict Islamic rules. The recipes and preparations come from his native Xinjiang, a region in western China that is home to more than 10 million Uighurs belonging to the ethnic Turkic minority. Most of the people who live in mainland China are ethnically Han Chinese. There have been ethnic tensions in Xinjiang since China began governing the region in 1949. Anti-government protests have occasionally become violent. Now some separatists want to establish an independent state in Xinjiang called East Turkestan. Over the past decade, the Chinese government has made a significant effort to keep control of the Xinjiang region and to encourage Uighurs to be more loyal to the Chinese nation. Authorities released a list of 75 signs of religious extremism citizens should watch out for. Men growing beards, women who refuse to shake hands with men, and anyone abstaining from drinking alcohol all made the list. In April 2017, the Chinese government stepped up the campaign. Tens of thousands of Uighurs were swept up and detained in internment camps. Now as many as 2 million members of Muslim minority groups are being held in hundreds of camps in western China, according to recent US State Department estimates. The Chinese government calls these camps re-education centers that are aimed at stamping out terrorism and religious extremism. As a result of the crackdown, the number of Uighurs living abroad with missing relatives is on the rise. “My dad is in one of the camps … I don’t know why he was taken,” says one Uighur Australian woman who used to work at Tarim Uyghur Restaurant in Sydney. She spoke on condition of anonymity to avoid retaliation from the Chinese government. She says while her parents were on a business trip in China last year, the government took their passports away. Soon after, she learned her father had disappeared. At a recent hearing on human rights in the Senate chamber in Washington, officials discussed the harsh conditions in camps reported by Chinese Muslim detainees, from torture and beatings to being force-fed pork and alcohol. At the hearing, Colorado Republican Cory Gardner and Massachusetts Democrat Ed Markey called for China to reverse its policies and release Uighur detainees. The Australian government has also expressed concern for the growing number of Uighurs in camps. Increasingly, Uighur Australians are speaking out because the situation in Xinjiang is so dire. Several thousand Uighurs from China now call Sydney, Melbourne and Adelaide home. Majid lives in Adelaide and travels around Australia to help migrants apply for visas and residency. He carries nan, a savory bread that is crispy on the outside and soft on the inside, on his travels and shares it with the people he meets. Back at Tarim Uyghur Restaurant in Sydney, Sultan Hiwilla brings goshnan to the table, its pretty fluted crust puffing with steam. Goshnan means “meat bread” in Uighur. Hiwilla’s version is two pieces of thin dough filled with minced lamb, onions, cumin and other spices, fried like a giant pancake over very low heat. Finally, the lamb kebabs arrive, tender marinated pieces of meat that are grilled over charcoal and dusted with more cumin. They slide easily off skewers onto the plate. As we eat, we cast an eye around the restaurant, at the pretty things from Xinjiang: stringed long-necked lutes called dutars, delicate hollowed-out gourds, colorful silk ikat fabrics, embroidered doppa hats. There is also a postcard of the Id Kah Mosque mosque in Kashgar, which once held 20,000 worshippers and is now shuttered. At Tarim Uyghur Restaurant, noodles are made simply with flour, water and salt. No added preservatives or flavors. Try Uighur food at Omar’s Xinjiang Halal in San Gabriel and Silk Road Garden in Rowland Heights. All photos by Stan Lee, Fried Chicken Sandwich Studios and 2016 James Beard Foundation visual storytelling award winner. This post made possible with help from KCRW’s Independent Producer Project.